In John 6:55, Jesus says, "my flesh is true food and my blood is true drink." 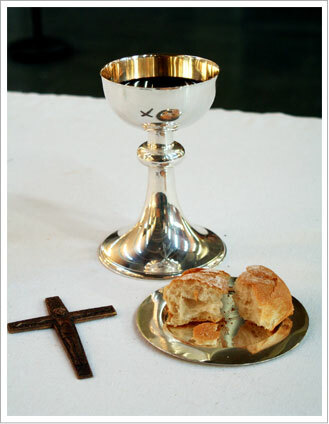 We believe that Jesus, who repeats this concept multiple times in John 6, meant what he said: that the bread and wine consecrated through his priests becomes His body and blood, soul and divinity. Believing this, we reverence the body and blood of Christ through Eucharistic Adoration. Check out this video on how Eucharistic Adoration has impacted people. What Do You Do at Eucharistic Adoration? During the hours in-between the rituals, the Blessed Sacrament rests on the altar in a monstrance (like a golden sun on a stand) for the faithful to see and adore. ("Behold the Lamb of God!" John 1:29) The in-between hours are quiet, and folks may come and go as they need to; it is traditional to spend a holy hour with Christ, but there is no minimum (or maximum!) time. Jesus wants all the time we will give Him! During your personal visit you can sit or kneel in any pew you like. Some folks even prostrate themselves for a time in the aisle before the Blessed Sacrament. This is your time with Jesus. How you pray is up to you. Maybe it's saying a rosary. Or just talking to God conversationally. Or working through a devotional, journal, or Bible study. Maybe it's just being there and listening. Whatever you do (or don't do), come with an open heart and you will be transformed. from 8:30 AM - 5 PM. Jesus is not to be left alone while He is exposed in the Blessed Sacrament, so we have a schedule of individuals who ensure that that doesn't happen. If you would like to be assigned to a particular time frame, please contact Gail Hankins. If you would like to participate in Eucharistic Adoration but prefer not to have a regular schedule, know that you are always welcome to participate as you are able. Just come on in!